What does Article 2 of the US Constitution deal with? The US Constitution was written on June 21, 1788 and consisted of seven parts, called 'Articles'. Article 2 of the US Constitution deals with the powers of the Executive Branch (Administration, headed by the President) and the powers of Congress and the Federal government. Definition and Summary: Article 2 of the US Constitution establishes the Executive branch of the US government and the election, powers and responsibilities of the President. The presidential powers include the right to pardon people and delay executions. The presidential duties include recommending taxes and laws. This article also details the process of impeachment in which any Public Officials can be impeached for treason, bribery or other serious crimes. Accusations of impeachment are made from the House of Representatives and impeachment trials are conducted in the Senate. 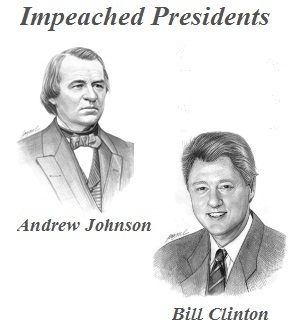 Two Presidents have been impeached - Andrew Johnson and Bill Clinton, both were acquitted. The first section of Article 2 of the US Constitution deals with establishment of the Executive branch of government and the election, of the President and Vice President. Article 2, Section 1, Clause 1 is the 'vesting clause' and establishes Executive branch of government with the President as the head. It states the presidential term as being four years. Article 2, Section 1, Clause 2 deals with the election of the President and the number of electors. Representatives and Senators are not allowed to be electors, nor are certain members of the governments. Article 2, Section 1, Clause 6 deals with the responsibilities of the Vice President and the process to follow should the President become incapacitated. The second section of Article 2 of the US Constitution deals with presidential powers. Article 2, Section 2, Clause 1 states that the President is in charge of the military. It also gives the President the right to request reports from each of the Executive Departments. It establishes his right to pardon people and delay the executions of criminals. The third section of Article 2 of the US Constitution deals with presidential responsibilities (Faithfully Executed Clause) including keeping Congress informed about the conditions in the US and other communication duties, and recommending taxes and laws. The fourth section of Article 2 of the US Constitution relates to Impeachment. Impeachment is a fundamental constitutional power that is a process that is used to charge, try, and remove any public officials for serious misconduct whilst in office. Public Officials can be impeached for treason, bribery or other serious crimes. Accusations are made from the House of Representatives and trials are conducted in the Senate. The full text of the Article 2 of the US Constitution includes parts that have been amended or superseded the original wording. Each section is shown separately for ease of reading. Each section is divided into clause numbers. Specific parts of Article 2 can therefore be referred to be sections and clause numbers. Clause 6: In Case of the Removal of the President from Office, or of his Death, Resignation, or Inability to discharge the Powers and Duties of the said Office, the Same shall devolve on the Vice President, and the Congress may by Law provide for the Case of Removal, Death, Resignation or Inability, both of the President and Vice President, declaring what Officer shall then act as President, and such Officer shall act accordingly, until the Disability be removed, or a President shall be elected. The article on the Article 2 of the US Constitution of the Constitution provides the text, definition and summary of the most important document in American history. The following video will give you an overview of the lives and the important political events of all of the Presidents of America.